Hello! 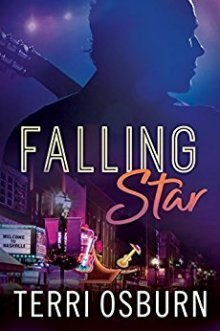 I’m Terri Osburn, author of contemporary romance, and I’m here to talk about my latest release, FALLING STAR. This is the second book in my Shooting Stars series, set in the country music world of big hair and bigger dreams. Chance Colburn has seen his dreams come true. But fame and fortune don’t mean much to the demons that haunt him, and after years of trying to drown the voices in a bottle of Jack, Chance lands in jail and then rehab. The story picks up during his recovery, when it’s time to get back to work. Shooting Stars Records is giving him the shot he needs to salvage his career. And in the process, he might have a shot to win back the only woman he’s ever really loved. Reason #1: The hottest bad boy in country music. Seriously, Chance is hot and damaged and cranky and protective all rolled into one. Did I mention he’s hot? Here’s a little description from the book. Squaring his stance, he slipped strong hands into the front pock­ets of his black jeans. Regardless of the venue, Chance maintained his casual style. Ruggedly handsome and screaming virile male—from the thick black hair dancing along the edge of his collar to the snakeskin boots on his feet. And the parts in between could bring a woman to her knees, as Naomi knew all too well. Reason #2: The only heroine who can handle him. Naomi is a fixer, and one of the most capable heroines I’ve ever written. At the same time, her struggles with her mother make her relatable and human. When it comes to Chance, she doesn’t always get things right, but she doesn’t give up and she doesn’t run when his cranky side comes through either. In fact, she calls him on it more often than not. She nearly ran to him. Ran to his side and offered soothing words. But no cooing or coddling was going to fix this. Naomi would be with him for the trial ahead, but she would not be bullied for her trouble, nor would she tolerate a grown man acting like a spoiled baby. Reason #3: Country music. I’ve loved country music for a long time and moved to Music City more than twenty years ago with a dream of working in the industry. But one of the first things you learn when you pursue such a dream is that Nashville isn’t as friendly as it appears from a distance. The town is, sure, but the music business is as volatile and tricky as the rest of the entertainment business. At the same time, there is a family there. As well as amazing talent and hard-working individuals striving to make beautiful, meaningful art. In FALLING STAR, you see both sides of this glittering and often gritty world, but you also get to see the good win out in the end. Reason #4: The bathtub scene. Seriously. You’ll thank me later. “Is that good?” she whispered in his ear, and Chance realized he was about to get what he wanted. Skilled hands slid along his rib cage before flattening against his pecs. Back once again against the porcelain, his head rested between two firm breasts. “I think we should rinse now,” Naomi said, hands trailing over his shoulders. Chance would have done anything she asked at that point. “Yes, ma’am.” Keeping his left hand out of the water, he dipped down and worked the lather out with the other. When he came up, Naomi stood beside the tub holding a towel. Reason #5: The sigh-worthy happy ending. I always write a happy ending, of course, but these characters went through so much and deserved true happiness more than most. As expected from a romance novel, that HEA does not come easy, and at times seems like it won’t come at all. Especially when Chance’s demons take charge once again. So he does the one thing he knows how to do, and that’s write a song. An apology set to music. It doesn’t fix everything, but it’s a step in the right direction. Pouring out his heart in a country song. Burn in hell before admitting when he’s wrong. Until the day she says I won’t do this again. There you go. Five heart-felt reasons to read FALLING STAR. I hope y’all will give it a try. Thanks to Night Owl Romance for letting me visit today and happy reading! Bestselling and award winning author Terri Osburn writes contemporary romance with heart, hope, and lots of humor. She fell in love with the written word at a young age and the genre of romance beckoned during her teen years. In 2007, she put pen to paper to write her own heart-melting love stories. Six years later, her debut novel released and became an Amazon number one bestseller. Since then, her work has been translated into five languages, and sold more than a million copies worldwide. Terri resides in middle Tennessee with her teenage daughter and a menagerie of high-maintenance pets. You can learn more about this international bestselling author by visiting her website at www.TerriOsburn.com.